Share the post "News: WIN BLACK SABBATH SEVENTIES SINGLES SET (Starts 10 June)"
This 10 disc set comes in a presentation box with unique or rare reproductions of the original sleeves as released in different territories. Check out Joe Geesin’s comprehensive review. 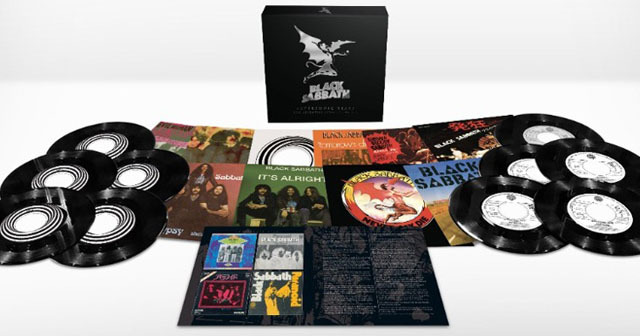 This limited-edition box set includes five rare single edits: Iron Man/Sabbath Bloody Sabbath/Am I Going Insane (Radio) /Hard Road/Symptom Of The Universe. This entry was posted in All Posts, Competitions, NEWS and tagged Black Sabbath, box set, collection, competition, heavy rock, prize, singles, Supersonic Years, The Seventies Singles, win. Bookmark the permalink.